In practice since 2005, Dr. Victor Peres was seeking an opportunity to serve his hometown community when he took over La Porte Chiropractic Associates in 2010. It’s been a chiropractic office since 1984, transformed into a family wellness practice for all ages, including pediatrics and pregnancy care. Dr. Peres is a member of Epic Pediatrics and understands how to help all ages of children, from birth on. With Dr. Peres’ precise, experienced care, our patients can see their overall health improve. You can live your life to the fullest without being held back by sickness. Chiropractic can allow you to thrive with a fully functioning nervous system. When your body can adapt to the stresses of life, you can enjoy your greatest potential. Children are also subject to the chemical, physical and emotional stresses of life. We see many babies and kids, and their response to chiropractic care is fantastic! Dr. Peres practices evidence-based chiropractic, using methods that are proven to show you results. 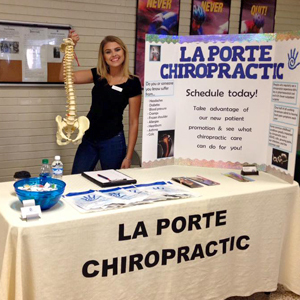 A powerful tool for showing us exactly what your body needs is available at La Porte Chiropractic Associates. The INSIGHT™ Subluxation Station uses NASA-certified technology to determine a reliable, scientifically valid measurement of your condition. Rather than relying on how you feel, we can analyze where you are when you begin care. Then, we can track your progress along the way to show objective results. Revitalize your health, starting today! Schedule your time with our warm and welcoming team to begin your journey to wellness.